Technical glitches at some of the ticket counters today forced a large number of sports enthusiasts to return home disappointed. The ticket counters outside stadiums hosting some of the most popular sports like boxing and swimming were not working due to power failure since early morning. On an average, about 100 commuters are being challaned daily for entering the lanes reserved for the Commonwealth Games traffic. Thank god weekends begin tomorrow! Offices would be closed and you can escape the traffic and security restrictions which will befall the city for two days. Road events for the Commonwealth Games (CWG) are slated to start tomorrow. In view of the Commonwealth Games cycling event on Noida-Greater Noida Expressway, the entire area has been transformed in to a high security zone from today. Twenty-year-old Pallavi Dutta is an enthusiastic volunteer at the Commonwealth Games. Lately, however, she comes back to her hostel irritated and exhausted, not because of work but because of poor meal service at her work area. Congress general secretary Rahul Gandhi, who has learnt boxing, on Friday turned up at the Talkatora Stadium to watch India's Olympic bronze medal winner Vijender Singh's bout at the Commonwealth Games. Even as dengue cases show no sign of abating, the health authorities have got a new problem on hand. Chikungunya, another disease spread by virus-carrying mosquitoes with symptoms similar to dengue, has struck the city. Jawaharlal Nehru University is all set to establish four new centres which have been in the pipeline for quiet sometime. However, the plans for establishing these centres have been finalised only this month after the UGC's approval. Adopting a no-nonsense approach towards any dereliction of duty during the ongoing Commonwealth Games, the Delhi police is not shying from suspending its men on even a slightest casual approach. Mohammad Ali Shah, head of the Pakistani delegation for the Gommonwealth Games, today claimed to have lost about 550 dollars (around ` 25,000) from his room inside the Games Village. In a turnaround, the Municipal Corporation of Faridabad (MCF), which was facing financial problems till about a year ago, has told minister of urban local bodies Mahendra Pratal about initiating development works worth more than Rs 150 crore, most of which the civic body will raise from its own resources. The son of a sub-inspector of the UP police has been held by the Indirapuram police for being a member of the notorious Amit Bhura gang of carjackers. Suspected money lenders are believed to have killed a railway employee here for not repaying a borrowed sum, the police said on Friday. Boxing fans were more disappointed as they had turned up to watch India's top pugilists-- Vijender Kumar and Akhil Kumar-in action. To make the situation worse, the workforce manning the counters had no idea as to when the power supply would be resumed. The people coming in with high spirits waited eagerly at the ticket counters outside SPM Swimming Complex and Talkatora Stadium, but returned disappointed. A huge rush of angry crowd was seen fighting for tickets. "The systems are not working and they are now asking us to go to India Gate to buy a ticket. This is so frustrating," said Pradeep, who had come with friends to watch his favourite boxer, Vijender's fight. Though people with online bookings were allowed to enter the stadiums, a lot of spectators complained that even the online booking system was not working till yesterday evening and even when it started working, it was very slow. Meanwhile, on allegations of giving away complementary tickets as scrap, the organisers said they could be the bundle of tickets that was given to the sponsors. "As per our agreement with the sponsors, we had given some tickets to them. It is possible that on failing to find buyers, the sponsors threw those tickets in scrap," said Lalit Bhanot, secretary general, organising commiittee. Meanwhile, OC chairman Suresh Kalmadi has claimed that six lakh tickets have been sold. However, Bhanot claimed the number of tickets had been sold. the welfare of children and underprivileged people. However, the organisers added that tickets of only those events would be given free of charge which are attracting minimum crowd. "There are some sports like shooting, gymnastics, netball, and lawn ball etc where the footfall is less than expected. We have decided to give tickets of these sports to NGOs working for the cause of children and the disabled," said Bhanot. However, there are no chances of distributing free tickets for popular events like aquatics, hockey, wrestling, boxing as their booking are full, claimed the organisers. The OC said they had already given 1,000 tickets to an NGO working for children, Smile Foundation. Apart from this, free tickets have also been handed over to the Delhi government. As per the Delhi traffic police, ever since the restrictions came into force on September 23, 1,799 people have been challaned for lane violation. Of these, 92 people were challaned today while two vehicles were impounded. The restrictions will remain in force till October 16, two days after the Games end on October 14. As per the special notification, the Delhi traffic police is imposing a fine of Rs 2,000 for any violation. "We have been asked to be very strict with regard to any encroachment into the exclusive lanes. It is not only a traffic issue, but also about the security of the athletes and foreign guests," said a traffic police official. A 20-km walk from Free Church at Parliament Street will start tomorrow morning. It will go to Outer Circus of Connaught Place, said officials. It would then take a U-turn and reach the Reserve Bank of India and return to Parliament Street. The traffic police said Parliament Street would remain closed for the general public from late tonight till 10:30 am tomorrow. Joint Commissioner of police (traffic) Satyendra Garg said the cycling competition would start around 9 am on Sunday and would cover Parliament Street, Red Cross Road, Rajendra Prasad Marg, Janpath, Rajpath and Vijay Chowk, besides, Outer Circus of Connaught Place, Barakhamba Road, Minto Road and Deen Dayal Upadhyaya Marg. These routes, he said, would be closed from Saturday midnight and restrictions would remain in force on Sunday till the event is over, expectedly by 7 pm. The Delhi police has stepped its already tight security for the road events. Apart from traffic regulations, helicopter-borne assault teams and commando hit squads would be deployed to ensure protection to athletes, a police official said. Many routes where the events were to take place have already been barricaded and round-the-clock patrolling is being conducted, said a senior traffic police official. Traffic will be blocked at South Fountain, Rafi Marg, Janpath, Rajpath, Rajendra Prasad Marg, Ashoka Road, Raisina Road, Tolstoy Marg, Outer Circus of Connaught Place, Barakhambha Road, Deen Dayal Upadhyaya Marg, Kotla Road, Bhav Bhuti Marg, State Entry Road, Imtiyaz Khan Marg and Talkatora Road for the smooth conduct of the event, confirmed a traffic official. Four thousand security jawans have been deployed across the city. From Noida entry point to Expressway, security guards have been deployed almost at every step. Sensitive spots, including malls, busy markets, bus stands, cinema houses, hotels, Metro stations and busy traffic crossings - all have been put under tight security cover. Each security jawan has been issued with a special identity card, which he is supposed to carry always. 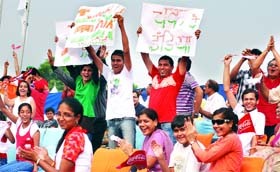 A rehearsal for the purpose was conducted when sportspersons were coming for practice on Expressway. IG Meerut range Chander Prakash said about 2,000 security jawans have been called from outside to GB Nagar. These include civil police, CISF and PAC personnel. They were briefed about the Noida area and their role. On October 10 and 12, when the full force reaches Noida, the jawans will be once again briefed about their duty. A full rehearsal for the cycling event will be conducted on October 12. About 200 women constables will also be deployed on these days, especially near Malls where incidents of eve-teasing take place. Dozens of policemen will be in plain clothes, Chander Prakash said. DSP Rajiv Narayan Mishra said it has been found that women are involved in most snatching and stealing incidents. Here policemen cannot interrogate or frisk them. Here, women police personnel would be effective. "I am on duty at the Yamuna Sports Complex where table tennis matches are on. I am enjoying but wish the food facilities were better. I reach here at 6.45 a.m. and all we are given for breakfast is biscuits and tea," Dutta told IANS. "Lunch is again delayed. Earlier, the lunch served used to be stale and inedible. Then they changed the caterers who now serve the lunch only around 3 pm by which time we have to leave," she added. Megha Sharma, another volunteer who did not want to name her work area, said: "The food we get is not good. If we have to eat from the cafe daily, it would be an expensive affair for us students who live on a tight budget." "The volunteers are not being treated well, with bad food being served even in places like the Ashoka Hotel," said another volunteer. Accompanied by brother-in-law Robert Vadra, Gandhi came around 6:30 pm and sat in the front row of the stadium. According to the officials at the stadium, both had bought the tickets for the match. Officials said no cases of chikungunya were reported last year, but this year, as many 20 persons have been confirmed to be suffering from it. Officials said 79 new cases of dengue were confirmed in the Capital today, taking the total number of affected people to 3,938. Talking about chikungunya, officials said the first case was reported about six weeks ago, but the cases have started picking up over the last week. The cases in the city may be more as many go unreported. In such cases, patients are given medication based on the clinical diagnosis, after which they are discharged. "The disease does not show up for first few days and the patient is given asmptomatic treatment. It takes four to five days for the body to produce proteins/ antibodies that are detected in lab test," said Dr Sanjeev Bagai, CEO of Batra Hospital. On an average, 10 per cent of 80 to 100 suspected viral patients in the OPD and IPD of Batra Hospital suffer from chikungunya. "Viral cases have been more or less the same as they were weeks ago. There hasn't been much dip. Apart from dengue, H1N1 and seasonal flu, there are cases of chikungunya. We have six to seven chikungunya patients in the hospital," Dr Bagai added. Like dengue, chikungunya is self-limiting and is caused due to the bite of aedes mosquito. But, the affect of the disease may last on the patient even after the normal period of seven to 10 days. The patient may suffer from severe joint pain and swelling even for months, say doctors. Three of the proposed centres will be part of the School of Social Sciences and one will be a special autonomous centre. The four proposed centres are -- centre for media research, centre for the study of informal economy, north-east studies research centre and the autonomous center for nano science. JNU spokesperson Poonam Qudeshia, said, "These centers will focus more on research. They will offer both postgraduate as well as doctoral research programmes. For instance, in case of the centre for media studies, the focus will be on research and not merely media studies." The centre, which is likely to become functional by the next year, aims to develop among students an in depth understanding of media, its engagement with society and politics. The programmes offered will largely cater to M.Phil and PHD students. The head of the centre for informal economy, Amitabh Kundu, said, "The stress of the programmes we are offering is on research, which remains an unexplored area in this field." Kundu said, "As informal economy was discovered in the early 1970s, many economists subscribe to the notion that it is a marginal and peripheral phenomenon. However, it is an emerging area for research and cannot be considered as a temporal phenomenon." The centre for nano science will be chaired by professor Sanjay Puri. Puri said, "The focus of the centre will be on generating research and there are a lot of expectations pinned on this. Nanotechnology is diverse, ranging from extensions of conventional device physics to approaches based on molecular self assembly; from developing new material with dimensions on the nanoscale to investigating whether we can directly control matter on the atomic scale." Puri elaborates, "There has been much debate on the future implications of nanotechnology. Nanotechnology may be able to create many material and devices with a vast range of applications, such as in medicine, electronics, biomaterials and energy production. We will expect our students to tackle the challenges of nanotechnoplogy"
A total of 31 policemen, including an assistant sub-inspector, have been suspended across various stadia and the Games Village so far. According to a senior Delhi police official, eight of these men were suspended on the day police commissioner Y.S. Dadwal went on a surprise check to the DTC bus depot close to Millenium Park in east Delhi. The depot is being used to park Games buses. Three other cops came under the line of fire yesterday. "To my knowledge, about 31 cops have been suspended so far and eight of them were suspended at the bus depot on October 5 after they were found missing from their assigned spots after making an entry in the register," said the officer, adding that the number of suspension is likely to go up in the days to come. As per the available information, while two cops, including a lady constable, were suspended at the Jawaharlal Nehru Stadium after they were found in a compromising position, another pair was suspended for similar offence at the Indira Gandhi Indoor Stadium on the opening day of the Games. "About 12 or 15 men have been suspended for dereliction of duty at the Games Village alone," revealed the officer, adding that majority of the victims include the latest batch of constables recruited by the Delhi police. According to the Delhi police spokesperson Rajan Bhagat, all the men on Commonwealth Games duty were warned well in advance that no dereliction of duty would be tolerated. "Security is our prime and only concern as of now. How can we tolerate any dereliction of duty in the present circumstances when the eyes of the world are focused on us. Every single person has to give more than 100 per cent and no negligence will be tolerated," said Bhagat. According to information, the theft came to Shah's notice soon after returning to his room after breakfast at dinning halls situated in the other part of the Village. A case in this regard has been registered at the the Commonwealth Games village police station. According to a Delhi police official, the cops are questioning some people from the maintenance department as they are the ones who are most likely to get easy entry into Shah's room. According to information, in a written complaint to the police, Shah has claimed that he left his room around 10.20 am and returned in less than an hour. "He was away for about 40-50 minutes and when he returned, the money kept in a blazer pocket was missing," said the police official. Shah was at the centre of a controversy when he marched with the national flag at the opening ceremony instead of weightlifter Shujauddin Malik, who had been designated for the honour. A boycott by the weightlifting team over the matter was averted after Pakistan Olympic Association president Arif Hasan intervened. The civic body put forth its plan at a meeting called by the minister today. The MCF had taken a loan of Rs 90 crore from its Gurgaon counterpart as it financial condition was not good. One of the agendas of the meeting was to review as to how the money had been spent. Giving details of the loan amount, MCF commissioner Mahtab Singh Sehrawat said Rs 50 crore had been spent before April 1 this year on developmental works announced by Haryana Chief Minister and on payment of arrears to contractors affiliated to the civic body. In the current financial year, the MCF has initiated development works worth about Rs 150 crore, which would be partially met with the balance of the loan money. The rest of the money will be raised by the MCF from its own sources. Meanwhile, at the meet it was decided to soon increase the volume of garbage lifted from the city under the solid waste management scheme. About 250 metric tonnes of garbage are lifted every day from the city and dumped at the solid waste management site in Bandhwari. It was decided to raise the volume of the waste lifted to about 500 metric tonne. He was held along with another gang member. The two have been identified as Arun and Ashwani Shukla. They were each carrying an award of Rs 5,000 on their heads while the leader of the gang, Amit, carries a reward of Rs 15,000. Incidentally, both the arrested boys are from well-to-do families. The police recovered a pistol each from them. According to SP (city), Avdesh Vijaita, the police arrested the two with a Honda City car near Kala Pathar on Wednesday night. Ashwani Shukla lives in F-6, Pearl Apartment, Indirapuram and Arun is a resident of Kishenpur village. Shukla's father is a government contractor while Arun's father Brijpal Singh is a sub-inspector posted in Mathura district. During interrogation, the two confessed to have looted the Honda City car from Windsor Park in Indirapuram at gunpoint from one Mohd Rafi on September 9. The two on September 15 also looted a Honda City car in Windsor Park from one Rajiv Khanna. The police has recovered the second robbed car also. Vijaita said dozens of loot and murder cases were pending in Delhi and western UP against the gang. Laxman (26), posted in Shakur Basti railway office as a class 4 employee, was killed on Thursday night. The incident came to light this morning when employees of a hospital here found his body lying outside and informed the police.